One day Çantanu fall in love with a boy named Setyawati king fisherman. But father Setyawati just want to give her daughter if Çantanu would later crowned her from Setyawati as crown prince and heir to the throne instead of Bhishma. Due to this severe requirement Çantanu continue to grieve. Seeing this, Bhishma who knows why his father so, to give up his right to the throne in Barata handed over to the son who would be born of Setyawati. Even Bhishma's promise not to sue whenever and promised not to marry in order later no child to inherit the throne Çantanu. Setyawati Çantanu marriage and gave birth to two sons each Chitrāngada and Wicitrawirya. But both these men died in battle without leaving descendants. Fearing extinction of the royal line, Setyawati pleaded with Bhishma to marry the two ex-law widowed by Wicitrawirya, respectively Ambika and Ambalika. However, this request was denied Bhishma remembering his vow not to marry. Finally Setyawati asked Wiyasa, his son from another marriage, to marry Ambika and Ambalika. Mating with Ambika gave birth Destarasta and childbirth Ambalika Pandu. Destarasta then married to Gandhari and gave birth to a hundred sons, while Pandu married Kunti and Madrim but had no child. Later when Kunti and Madrim mate with gods, Kunti gave birth to 3 children each with god Dharma was born Yudhisthira, by the god Bayu born Werkodara or Bhima and Arjuna was born with the god Indra. While Madri who is married with twin gods Aҫwin, born twins named Nakula and Sahadev. Furthermore, the descendants descendants descendants Destarasta halved the Tribe called Kauravas, while the descendants of Pandu were called Pandavas. Actually Destarasta entitled to inherit his father's throne, but because he was blind from birth, the throne was then given to Pandu. 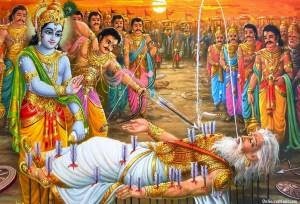 It later became the source of disaster between the Pandavas and Kauravas in the fight over the throne to drag on, until finally the devastating war called Baratayuda which means battle royal fight Barata. The battle begins with gambling action in which the Pandavas lost. This defeat caused them to wander in the wilderness for twelve years. After that, in the 13th year under the agreement with the Kauravas, the Pandavas had to hide himself in a certain place. However, the Pandavas decided to hide in the king's court Matsyapati. The following year, the Pandavas out of hiding and show themselves in public and claim their rights to the Kauravas. But their demands are not met Kauravas to 18 day war that led to the disappearance of the Kauravas. Thus, the Pandavas freely took power in Barata. Bhishma is run in accordance with the promise Sukla Brahmacari ever uttered. Drona and Bhishma who desperately defending State. Arjuna and other Pandavas who fought to uphold justice. Duryodhana wanted Astina fully mastered, until Indraprasta also want controlled.